The first Italian States stamps for the Duchy of Modena were issued in 1852. The Duchy of Modena, located in the Northwestern portion of the Italian Peninsula, existed from 1452-1859, with the exception of the Napoleonic War. After 1814, the duchy was ruled by the royal House of Este. There are numerous errors on the stamps of Modena, with many of them being misplaced, misaligned, or missing letters and / or numerals in the inscriptions. See the major catalogs for details. 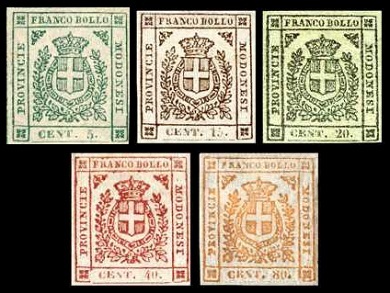 The six major-type definitive Italian States stamps for the Duchy of Modena shown above were issued between 1852 and 1857. The stamps are typographed in sheets of 240, divided into panes of 80, and they are imperforate. The 1 Lira denomination has a large letter "A" watermark. The other denominations are unwatermarked. There are printed dividing lines between the stamps. The common design features a crowned eagle, within a wreath. The stamps are inscribed "ESTENSI", meaning "of the House of Este", the name of the contemporary ruling house of the Duchy of Modena. The Scott catalog attributes, for stamps having NO PERIOD after the figure of value, are as follows. 05 C. (1852 - Sc. #1) - Black on Green. 10 C. (1852 - Sc. #2) - Black on Rose. 15 C. (1852 - Sc. #3) - Black on Yellow. 25 C. (1852 - Sc. #4) - Black on Buff. 40 C. (1852 - Sc. #5) - Black on Blue. The Scott catalog attributes, for stamps WITH a PERIOD after the figure of value, are as follows. 05 C. (1852 - Sc. #6) - Black on Green, Black on Olive Green. 10 C. (1857 - Sc. #7) - Black on Rose. 40 C. (1854 - Sc. #8) - Black on Blue. 01 L. (1853 - Sc. #9) - Black. There are forgeries of all the Italian States stamps of the Duchy of Modena. Many of them are crudely lithographed, and their characteristics as forgeries are obvious. Other forgeries, with some being typographed and of excellent quality, are more difficult to identify. Forged postmarks on original stamps also exist. 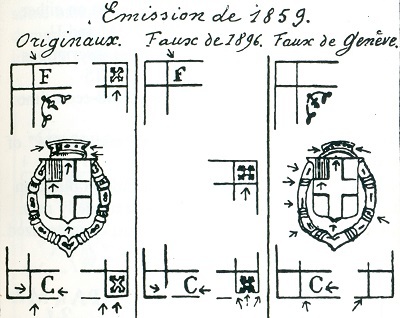 The illustration shown above, from the Serrane Guide, features the major attributes of the original stamps and the well-known Genoa Forgeries. The five definitive Italian States stamps for the Provisional Government of Modena shown above were issued in October 1859. These stamps are typographed in sheets of 120, divided into panes of 30, and they are imperforate. There are printed dividing lines between the stamps. The common design features the Coat of Arms of the House of Savoy. The stamps are inscribed "PROVINCIE MODONESI", meaning "PROVINCES of MODENA". The word "MODONESI", used in the inscription on these stamps, is actually a misspelling of the word "MODENESI". 05 C. (1859 - Sc. #10) - Green, Emerald, Dark Green. 15 C. (1859 - Sc. #11) - Brown, Gray Brown, Black Brown. 20 C. (1859 - Sc. #12) - Lilac, Violet, Blue Violet. 40 C. (1859 - Sc. #13) - Carmine, Brown Rose. 80 C. (1859 - Sc. #14) - Buff, Brown Orange. Sardinian postage stamps were also used in Modena, during this period. These stamps, with authentic Modena postmarks dated before February 1860, are in very high demand by Italian States stamp collectors and postal history specialists. There are forgeries of all the Italian States stamps of the Provisional Government of Modena. Many of them are crudely lithographed, and their characteristics as forgeries are obvious. Other forgeries are more difficult to identify. The illustration shown above, from the Serrane Guide, features the major attributes of the original stamps, the Genoa Forgeries (so-called "reprints of 1896"), and the Geneva Forgeries. Some of the other common attributes of forgeries are as follows. Six vertical lines, instead of five, in the top quarters of the shield. Five vertical lines, instead of six, in the bottom quarters of the shield. The line under the value connects with the corner squares. No dot after the value numeral. 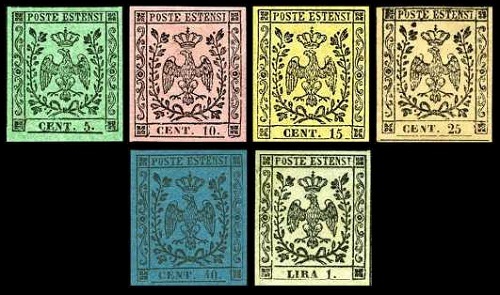 The four newspaper tax Italian States stamps for the Duchy of Modena shown above were issued between 1853 and 1857. The characteristics of these newspaper tax stamps are the same as those of the regular postage stamps issued during this period. 09 C. (1853 - Lg. Letters - Sc. #PR1) - Black on Grayish Violet. 09 C. (1853 - Sm. letters - Sc. #PR2) - Black on Grayish Violet. 09 C. (1855 - Sc. #PR3) - Black on Grayish Violet. 10 C. (1857 - Sc. #PR4) - Black on Grayish Lilac. The attributes of the forgeries of these newspaper tax stamps are the same as those of the regular postage stamps of the same design that were issued during this period. The Italian States stamps of Modena were replaced by those of the Kingdom of Sardinia during February 1860. Collecting the Italian States stamps of Modena can become a rather expensive venture. In the 2017 Scott Standard Postage Stamp Catalogue, depending on the variety, the prices can range from under fifty dollars to over two-hundred-thousand dollars. Francis V was the last sovereign of the Duchy of Modena. He was a just and popular ruler. However, the 1850's were a time of revolution in Italy, which would ultimately culminate in the unification of Italy by the Kingdom of Sardinia. His duchy would not survive. During the Second Italian War of Independence, also known as the Austro-Sardinian War, Modena was invaded by the army of Piedmont, and a provisional government was established. 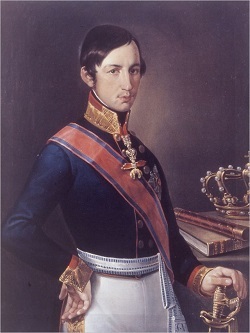 Duke Francis V sought the protection of the House of Hapsburg, and on June 14, 1859, he fled to Austria. In December 1859, Modena merged with Parma and Tuscany to form the "United Provinces of Central Italy". In March 1860, the United Provinces were annexed to the Kingdom of Sardinia. Duke Francis V would spend the remainder of his life, living in exile in Austria. The 10 C. denomination newspaper tax stamp shown above (Sc. #PR5) was issued February 1859. It is typographed on unwatermarked paper, and it is imperforate. There are horizontal guide-lines between the stamps. There is a variety with vertical guidelines, but it was never actually issued. These stamps were used to pay the fiscal tax on newspapers coming from foreign countries. 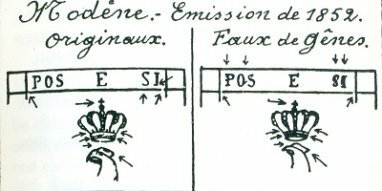 The illustration shown above, from the Serrane Guide, shows the major attributes of the originals and the forgeries of this newspaper tax stamp.